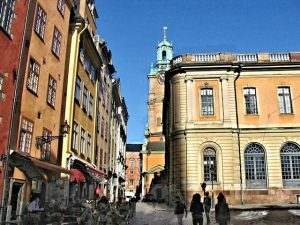 Stockholm is unique among all the capitals of the world. Beauty is obviously a subjective thing, but a city built on islands close to 1000 years ago and then growing to the north and south but still having for many centuries as much water as land surface, must be considered pretty much exceptional. On a sunny day Stockholm is a jewel of water and glowing façades, the sun gleaming on the beautiful old buildings and the ripples on the water. The street called Strandvägen is one of my favorite strolling places in Stockholm. On one side you see the most patrician old apartment buildings in all of Sweden and on the other side is the water with the mooring bollards for fishing boats and now also an ever increasing number of tourist boats. In between is the heavily tree-lined walking alley. 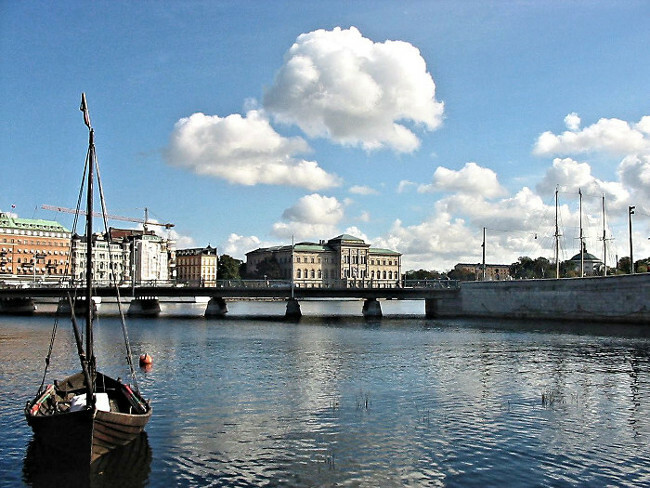 This street takes you down to a bridge, Djurgårdsbron, leading to Djurgården, an island that has its very own history and beauty. And it also has many unforgettable places to wander around in. I lived in or close to this beautiful city for four years around 1960, but I have rarely appreciated the city as much as with John. Who was the guide, he or I? 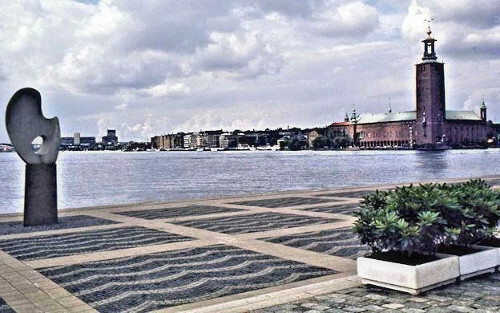 During the summer of 1971, the first timeJohn and I visited Sweden, we of course visited Stockholm, and John also got to know this beautiful city and even more friends. 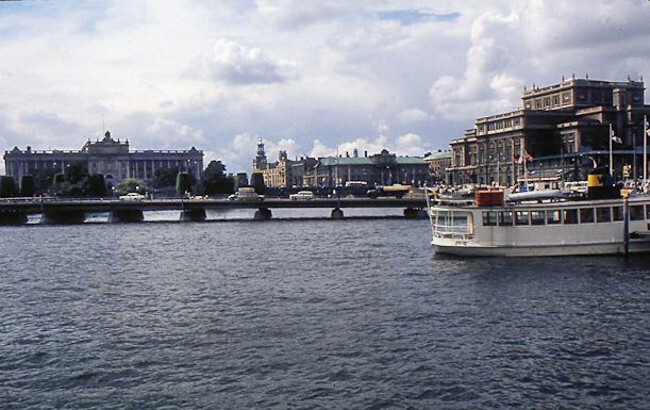 Stockholm sits on several islands on Lake Mälaren. Gamla stan, the Old Town, with the Royal Palace, is the main one of all these islands but there are several other islands that are part of the city. Of course the major parts of the city have long been on the mainland north and south of the lake. There are some places in our capital that are exceptional and I remember Mother showing my sister Gun and me around Stockholm when we were still in high school. Gun was confirmed in 1946 (Don’t ask me why – we did those things because our friends did, I think.) by an old childhood friend of Mother’s who was now a vicar in a town called Eskilstuna close to Stockholm. Gun spent the summer with his family and I and Mother picked mushrooms off the asphalt sidewalks in Malmö. 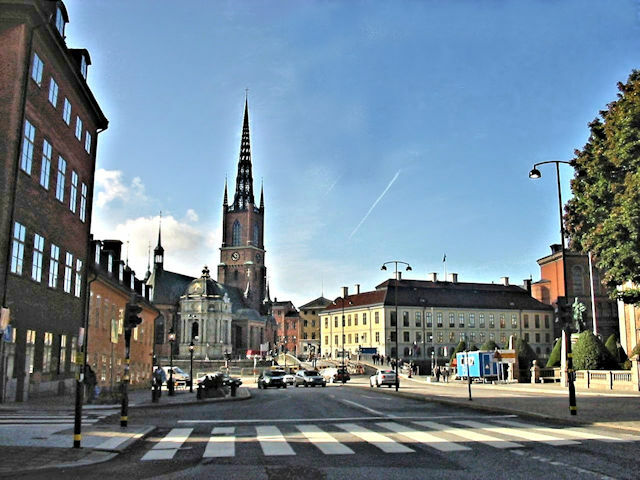 At the end of the summer we all went to Eskilstuna to see Gun get confirmed and afterwards we continued up to Stockholm to make our first acquaintance with our capital. The Stockholm City Hall seen from Riddarholmen. 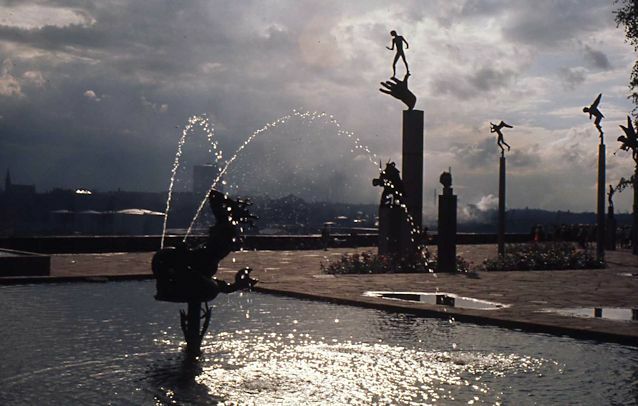 The sculpture is th, Evert Taube’s Terrace. “Sun Boat”by Christian Berg. It’s amazing to realize how enterprising and healthy Mother was at that time. There was of course no metro in those days, but Mother took us around by streetcar and bus. And we walked a lot of course, the way you still have to do if you want to really get to know a big city, be it London, Berlin, Prague or Istanbul. Arne wasn’t even with us but Mother showed us around all the most see-worthy places in Stockholm. There was the City Hall with ‘den gyllene salen‘, the Golden Hall with its fabulous mosaics, It was so huge I felt awed as I was looking up into the far-away ceiling. 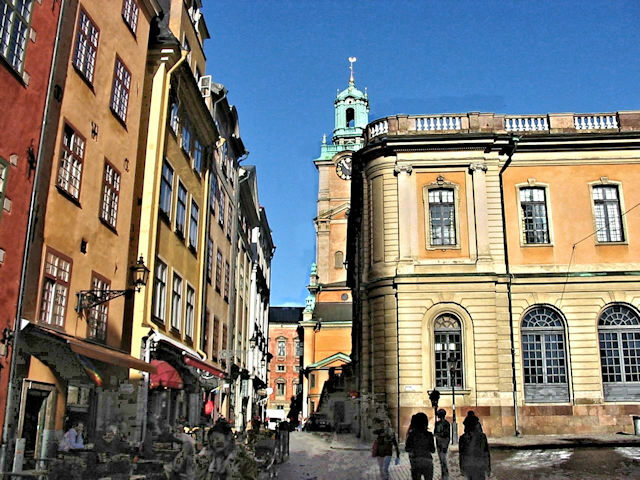 Gamla stan – the Old Town with its Hanseatic buidings — and Stortorgsbrunnen, an old water fountain, actually a real old well. Stockholm Cathedral, Storkyrkan seen from Stortorget in the foreground. 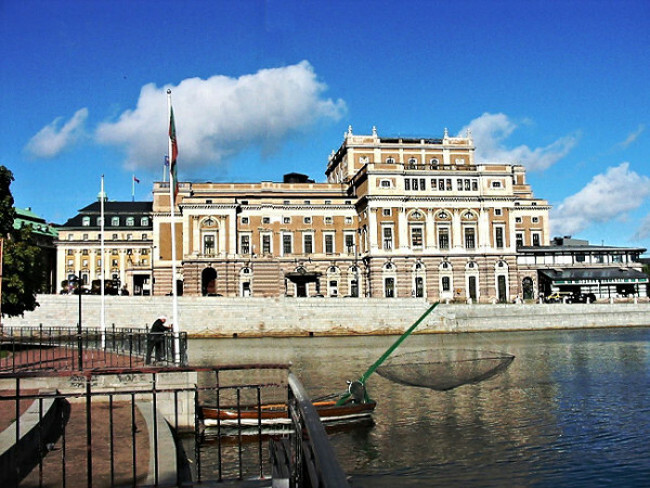 The Swedish Academy on the right. Sidewalk café in a corner of Stortorget. We went on a tour of the huge rooms inside the Royal Palace which is right next to Storkyrkan and we marveled at the splendid interiors. We watched the change of the Guard (Vaktparaden) at Slottsgården behind the main buildings. 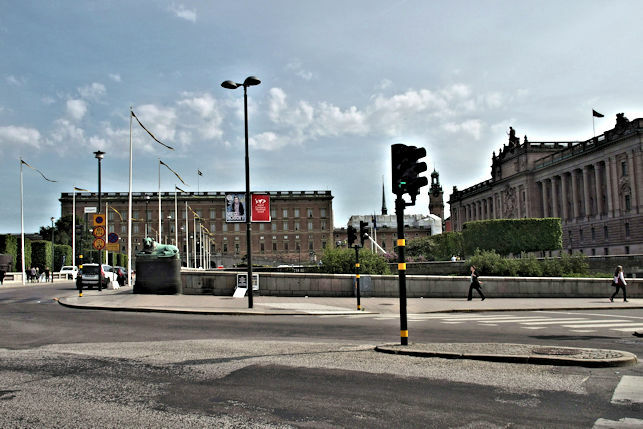 We were standing facing the Royal Palace, Mother, Gun and I, by the bridgehead of Norrbro (the northern bridge). 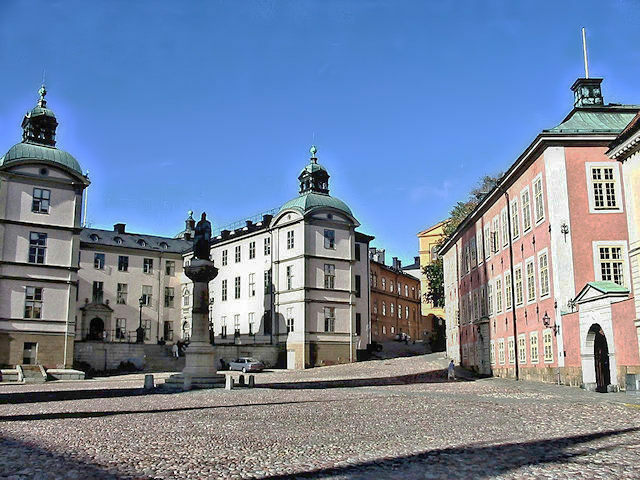 Gustav Adolf’s Torg, the big plaza, was behind us. Norrbro is the bridge that connects the Old Town, Gamla Stan with Norrmalm, the northern mainland. I was looking down at the strange-looking huge nets attached to several fishing boats moored on the side of the bridge. 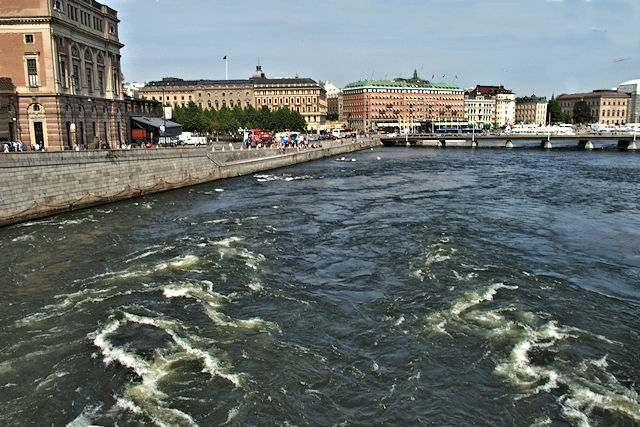 All fascinated, I looked into the eternally swirling eddies of the water at this place, which is called Strömmen, or more exactly Norrström, the North Stream. It seemed as if witches were stirring the water with enormous ladles, as in a witch’s brew. 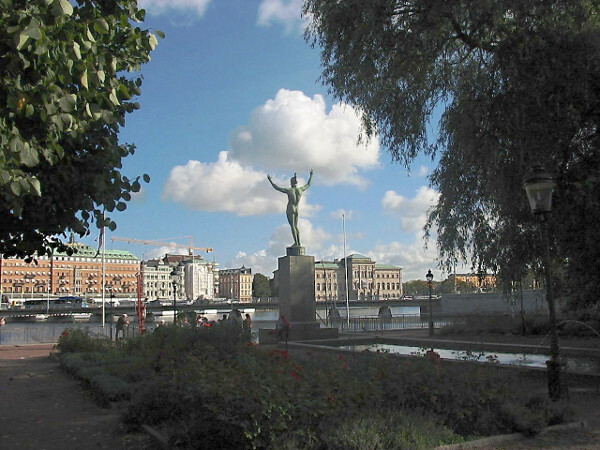 The eddies, the Royal Palace and Gustav II Adolf on his horse in the center of the plaza have not changed, and on the little island, Strömparterren, partly under the bridge, there was already in those days a statue that adds to the beauty of this little island. 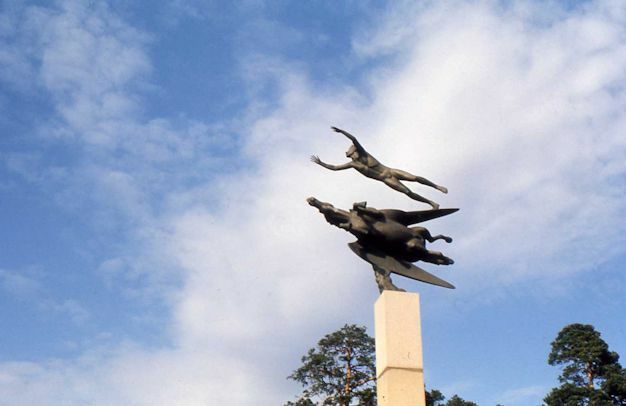 The world famous sculptor Carl Milles created this graceful bronze statue, Solsångaren, the Sun Singer, which has replicas in several places of the world. From here you can look far out over Strömmen to Blasieholmskajen, the water front off Grand Hotel, the National Gallery. 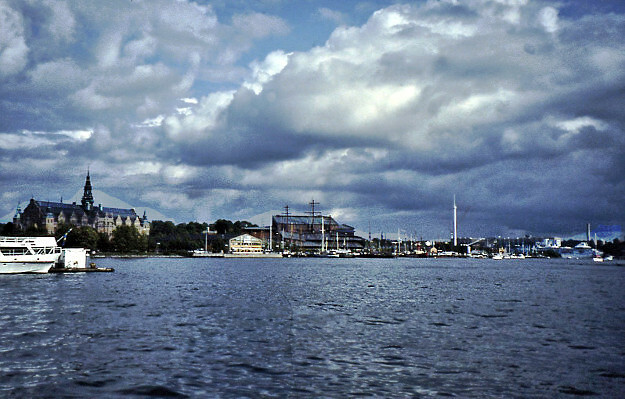 Skeppsholmen (the ships’ island) can vaguely be seen on the right. 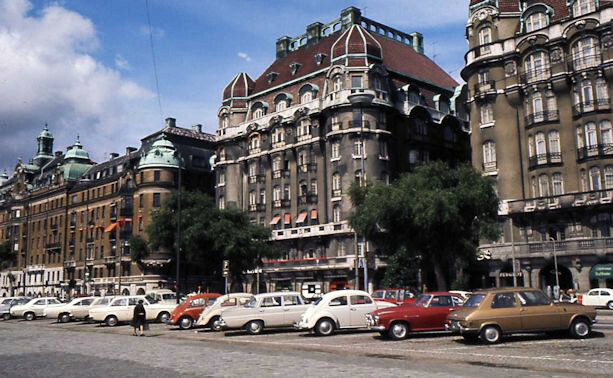 There was Kungsgatan and Stureplan (amazing how all is changed today! ), NK (Nordiska Kompaniet), the big department store on Hamngatan, the central commercial areas of Stockholm with an endless number of luxury stores all around Norrmalmstorg. 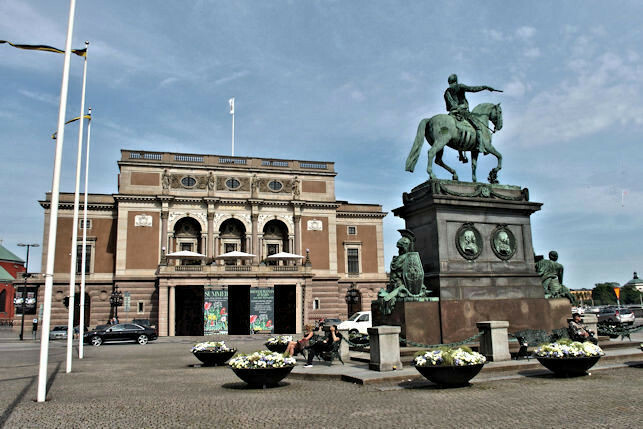 That plaza is where you changed streetcars very often and it was very close to the Royal Dramatic Theater, usually called Dramaten, and Nybroviken, the water where all sorts of boats are moored in a bay of Lake Mälaren and that is the beginning of my beloved Strandvägen. All these plazas and streets together were the ‘downtown’ of Stockholm in my days. It has now more or less been replaced by Sergels Torg which is right over the central metro station, T-Centralen (T for tunnelbana). 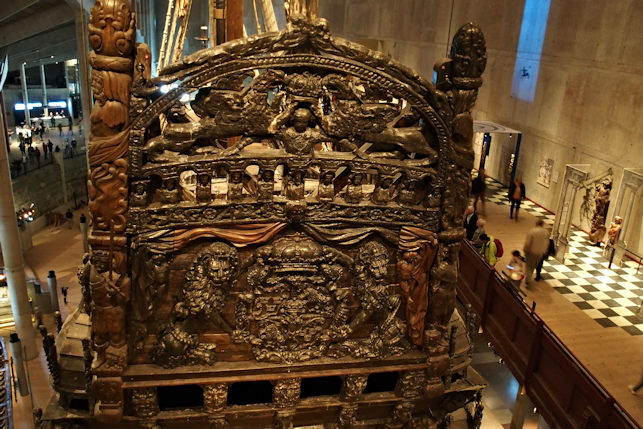 And of course there was Djurgården with the amusement park, Gröna Lund and, most of all, Skansen, the fabulous open-air museum that is a must to see if you are in Stockholm. Gun and I enjoyed both immensely. I now know that Djurgården is also still covered by woods where you can take long peaceful walks without any interference from the noise of modern electronic bang-bang and polluting vehicles. 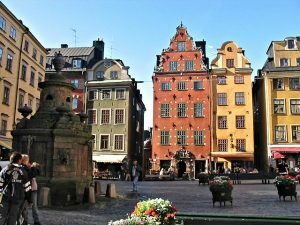 There was Slussen (the lock) where we traveled up in the elevator, Katarinahissen, that joins Gamla stan, the Old town, and Södermalm (the South) that has since then become so much in vogue, especially for artists and bohemains. Katarinahissen is the elevator in which Paul Newman in a thriller, The Prize, rides up to the upper level and very nearly gets killed. 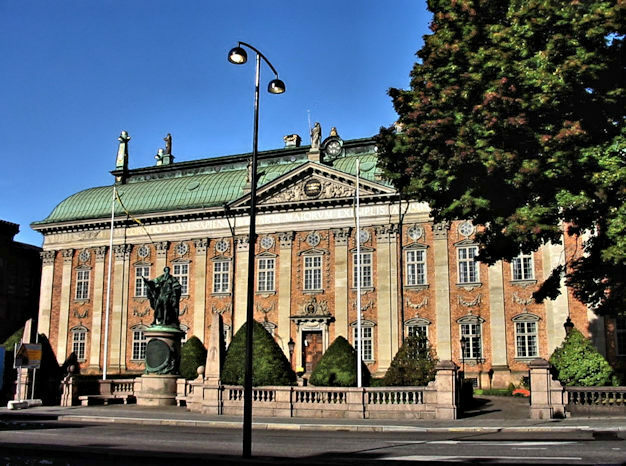 He is an author who has come to Stockholm to receive the Nobel prize but he is thrown off the top level of the very high building by his pursuers and is only miraculously saved by falling into the water. The elevator takes you off the level of the water up to the part of the city where Söder really begins. The view from the top of the elevator with the restaurant, Gondolen, is breathtaking – water, more water, and yet more water, and a myriad of islands, ferries that take you to Åland 2, islands in the Baltic that are part of Finland, and innumerable sail boats. 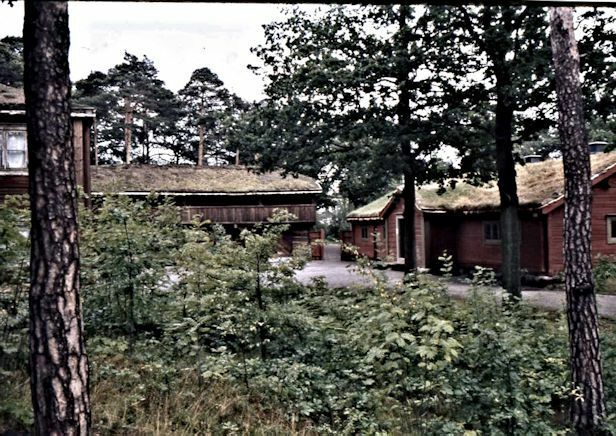 Skansen is the open-air cultural museum on Djurgården (= Animals Garden), so called because it became a royal hunting ground after Gustav Vasa confiscated the island from the Catholic church. Gustav Vasa objected to the Pope having any power whatsoever over Sweden and introduced Protestantism into the country. He certainly also wanted access to the wealth of the Catholic church, and he got it. 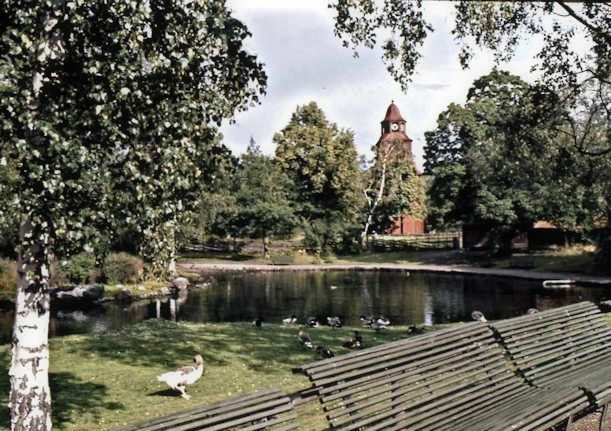 Djurgården was opened to the public in the 18th century. 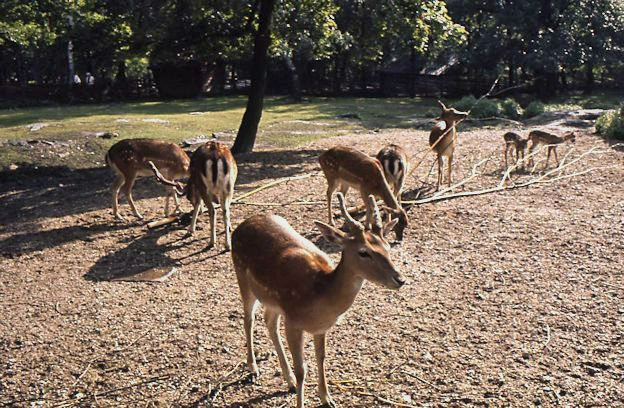 This wonderful huge area on Djurgården is the oldest open-air museum in the world and it also has a zoo, which Mother, the supreme animal lover, delighted in showing us. Skansen is a historic Sweden in miniature, where you can learn about arts and crafts and about how people lived and worked in past centuries in our country. 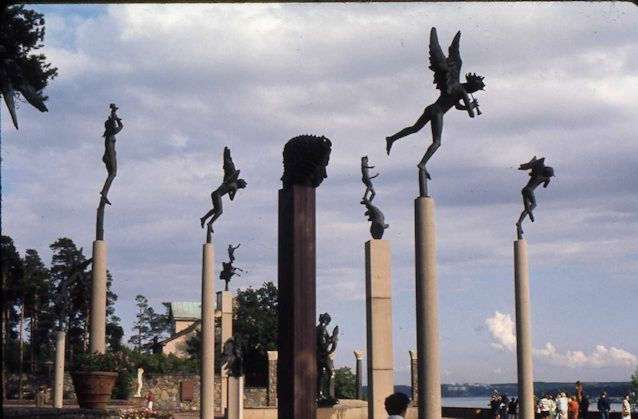 In 1971 John and I, on our very first visit to Sweden together, went to the wonderful Millesgården on Lidingön, another Stockholm island – a gorgeous outdoor museum that is devoted exclusively to the famous sculptor, Carl Milles (1875-1955). 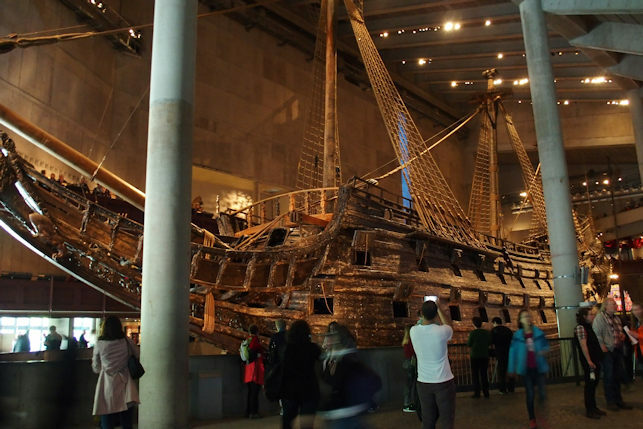 We did not see this museum with Mother since it was not at that time the outstanding attraction that it has since become. Ever since its opening to the public in 1936 it has kept changing and growing. 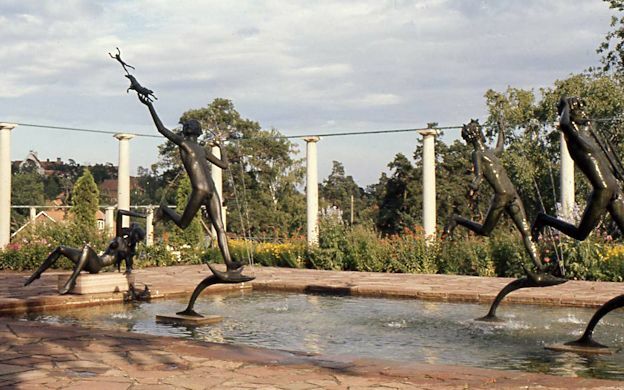 Today you will find most of Milles’ most important sculptures in this park, and replicas all over the world, The Metropolitan Museum in New York City among other places has, for instance, the Fountain of the Muses and you can admire it while you have lunch in the beautiful restaurant. 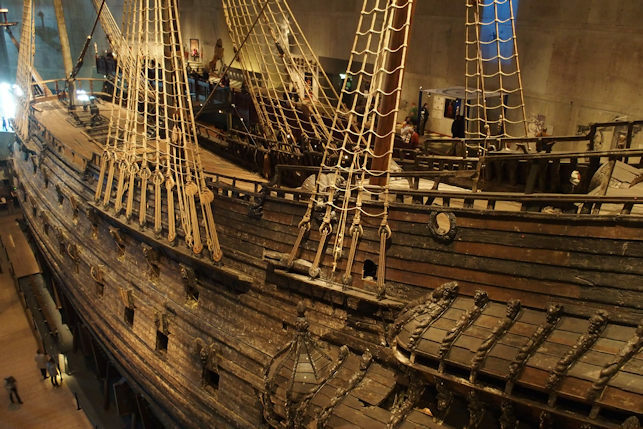 However, for the past few decades the main source of attraction for tourists has been the Vasa ship and its museum on Djurgården. John and I saw it when it was still being watered day and night, and the hall where it was while undergoing restoration work was all steamy and clammy. 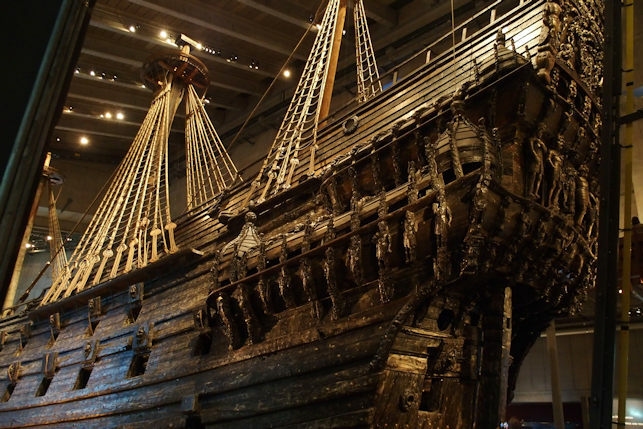 It’s the only ship in the world that still remains today from the 17th century. Here is a real period piece in ‘Stockholm spårvägar’. Just leaving Norrmalmstorg. Måns came up from Linköping and spent a wonderful sunny Sunday with us. In fact he invited us to everything. It also so happened that it was ‘Spårvägens dag‘, the Day of the Streetcar, and both Måns and I just love old streetcars. 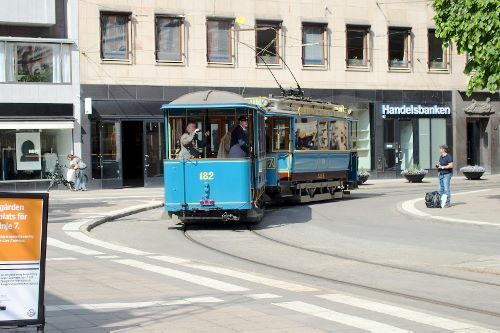 We were sitting in Norrmalmstorg (the Plaza of the northern mainland – Stockholm is not all built on islands), the very center of Stockholm where I have changed streetcars innumerable times. I got a good laugh when we saw a streetcar from the years I used to live in or close to Stockholm, in the early sixties. I realized that this streetcar was now history, but there were of course older ones yet. I can never get enough of Stockholm. I love it. But, as I said when talking about Copenhagen, there is one important thing missing in Stockholm. There is none of the wonderful Gemüt in our capital that Copenhagen is so well-known and well loved for.